Based on the international best-seller. "A moving meditation on the power of love, music and proximity." - LA Times. 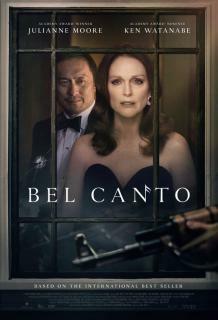 “It’s 1996 and a Japanese business executive journeys to an unnamed South American country ostensibly to consider opening a factory but really for the opportunity to hear his favourite opera diva sing. “But things go terribly awry when rebels take over the large home where the dignitaries have gathered, an event the country’s president has serendipitously skipped to watch his favourite telenovela. The rebels decide to let the women go except for Roxanne Coss, when they realize the prize they have in an international superstar. “But the government — probably as corrupt and oppressive as the rebels allege — are not about to show weakness, so a long siege ensues, during which Stockholm Syndrome sets in and the rebels and their captives begin to see each other as people rather than adversaries.